A month-long survey of the deep waters from Georges Bank to the continental shelf south of Rhode Island has turned up an unexpectedly large number of a little-known whale, and scientists are excited that they were able to tag one of the animals for the first time. True’s beaked whales were first identified in 1913 by Frederick W. True and have seldom been observed anywhere in the world since then. But researchers from the Northeast Fisheries Science Center in Woods Hole, Mass., saw and heard several of the elusive animals almost daily during their expedition from July 20 to Aug. 19. Portsmouth native Annamaria Izzi, one of the biologists participating in the expedition, jokingly described True’s beaked whales as looking “like ugly upside-down dolphins” with no teeth inside their mouth but two teeth sticking outside their mouth that males use to fight with each other. Every day during the research cruise, Izzi and her colleagues deployed an array of hydrophones — underwater microphones — that were dragged behind the ship to listen for whales. “We went from knowing nothing about them to having interesting clicks on the hydrophone and a couple visual approaches that cued us in to what they look like and sound like,” Izzi said. The clicking sounds were created by the whales using their echolocation abilities to navigate in the darkness of the deep water. “Beaked whales are similar to bats in their use of echolocation,” she added. One of the main accomplishments of the expedition was the tagging of one True’s beaked whale using what scientists call a digital acoustic recording tag attached to the whale with a suction-cup. The device recorded the movements and acoustic behavior of the whale for about 12 hours before it came off and was recovered. The scientists will soon compare the diving behavior they recorded of the True’s beaked whales to the behavior of other species of beaked whales. Izzi said the expedition raised a lot of new questions. The scientists also collected water samples in the immediate vicinity of where the beaked whales swam in an effort to collect bits of whale DNA. A dozen eDNA samples were collected by the scientists and paired with biopsy samples and whale photographs to match the DNA samples to specific animals. Why are True’s beaked whales being found in good numbers in the waters off southern New England? Izzi said it’s because the whales prefer the habitat around small island chains or underwater mountains, and the edge of the continental shelf and the seamounts in the new marine monument provide that unusual habitat. Izzi said the next step in studying True’s beaked whales in the region is to place more tags on the marine mammals. The research is being conducted as part of the Atlantic Marine Assessment Program for Protected Species, an annual survey sponsored by the National Oceanic and Atmospheric Administration to assess the populations of marine mammals in area waters. 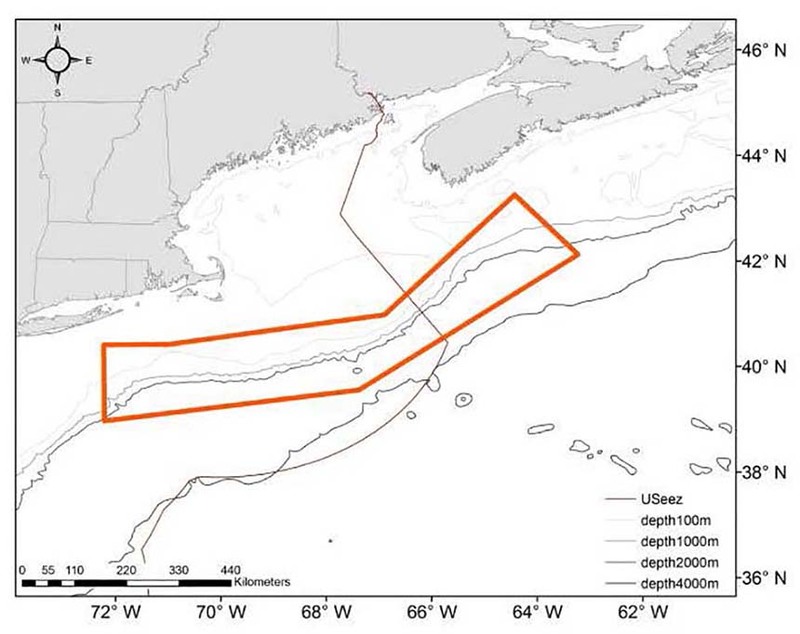 The program focuses on the collection of seasonal data on the abundance, distribution, and behavior of marine mammals, sea turtles, and seabirds in the Atlantic Exclusive Economic Zone.